The route shown combines the Wharemauku Stream walk and Paraparumu Aerodrome walkway. There are many entry and exit points so you can make the route as long or as short as you wish. You can walk both sides of the stream, and there is a good gravel path suitable for cyclists down one side of the stream and around the Kapiti Road side of the aerodrome - other parts are grass and can be soft and hard to ride after rain. You can park in Coastlands carpark for up to 4 hours, and there are toilets inside Coastlands shopping centre. This is opposite the start of the walkway about 50 metres south of Paraparaumu public library on Rimu Road. At this part of the route the best track is the gravel path on the south side of the stream. There are access points from Manawa Avenue and Kiwi Road each side of a small wetland and pond. There is another grassy access road about 250 metres south of Kiwi Road, which leads back to Kiwi Road. 150 metres further down the main track crosses a footbridge and the gravel path continues on the other side of the stream. It is best to cross here, as the south stopbank path ends about 400 metres further on though it is possible cross a field and exit to Moa Road and rejoin the track on Tui Road. The track continues to Weka Park, crosses Alexander Road and finally terminates on Matatua Road (where there is track map sign). Near the footbridge which is directly in line with the runway of the Paraparaumu aerodrome, there is another walkway going north along the side of the aerodrome. This is an open grassy track with several exit points to nearby streets. It skirts around the side of the aerodrome with a sealed path in places, and exits on Magrath Avenue near Kapiti Road. If you are doing a long circular loop walk you can walk back to Rimu Road via Kapiti Road. If you want back along the northern bank of the stream the path is grass and softer than the gravel path on the southern bank. You can exit back on to Rimu Road near the library, or on to Kapiti Road. For walking times, allow about 30 minutes to walk one way from Rimu Road to Matatua Road past Weka Park. 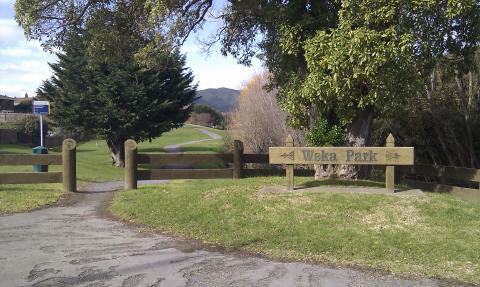 Another 45 minutes to walk one way from the Wharemauka Stream track to the other end of the aerodrome walkway. Double these times for a return loop. There are access points from Manawa Av/Rata Road corner; Kiwi Road; Tui Road; Alexander Road; Matatua Road; Titoki Road; Waikare Road; Avlon Tce; Tahi Road; Toru Road; and Magrath Avenue off Kapiti Road. There are many entry/exit points along the route, but the start and end points are on Rimu Road near Paraparaumu Library, and on Matatua Road about 100 metres south of Tui Road junction. Suitable for cyclists and walking dogs.